Invoice discounting service charge is often the term people use when referring to the "administration charge" made for invoice discounting services. It is the percentage of your turnover that you pay the funder to use the service. GET A QUOTE WITHOUT OBLIGATION (and no impact on your credit score). Read about how the costs are made up and what typical costs will be. To compare the fees between providers, quoted for the same customer situation, we estimated the facility usage and used that to calculated estimated fees for our prospective customer. We used the same projected turnover and facility usage projections across all providers, making the comparison fair. 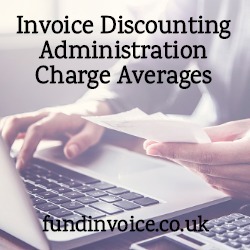 Service charge, or admin fee, is the "headline rate" that many people use to compare different invoice discounting offers, often ignoring the other charges, that can form a large percentage of the overall costs. We have undertaken a lot of research comparing prices between different invoice discounters, and we identified an 86% difference between the cheapest invoice discounting companies and the most expensive. Looking at those results, I have identified the percentage of the charges quoted that were service charge, rather than discount charge (any other additional fees were ignored for the purpose of this comparison). For normal, recourse style confidential invoice discounting, the service charge represented 59% of the total fees quoted by the provider. Across the quotes that we obtained for a given customer, the range of quotes included service charge accounting for between 49% and 66% of the total cost (with the remainder being discount charge). Looking at the quotes received for non recourse style, protected invoice discounting (also called PID), the service charge accounted for 69% of the total fees quoted, with the range being from 59% to 75%. We often see examples of customers comparing quotes based on either just service charge (admin fees) or discount charge - which works in a similar way to interest, hence people are often drawn to comparing that figure as you might for an loan or overdraft. What these results show is that both service charge and discount need to be taken into consideration, as they both tend to account for significant proportions of the costs that you will be quoted for invoice discounting. The wide ranges within the results show that failing to consider one or other element could result in a completely misleading comparison of the fees between providers. My recent post about another example of how fees are broken down may be of interest to you. It was an extreme case where 82% of the fees were service charge, but the customer was hung up on getting the lowest discount rate, when that had the least influence on the bottom line cost. The way that invoice finance prices are calculated is confusing, and we are always available to help you understand the quotes you have received, and get you the best prices that we can find you. On average, we have been able to save our clients 34% on fees quoted elsewhere. Call Sean on 03330 113622 for help with quotes.